With a spring in our step we are about to bound into the Christmas period for full on guilt free indulgence, festive fun and a month of hangovers. With this is mind we have a few parties planned of our own. And as lame as it may sound we are already planning the menus – easier to just get it out of the way as our evenings are soon to be spent pounding the streets with a list of Christmas presents, and hopefully attending other peoples parties! This year we have decided to skip canapes on our parties – they are a total bore, and always catch you off guard at the last minute. Instead it’s all about bowls of marinated olives, slices of fantastically good cheese and some fresh sourdough to dip into the best quality olive oil you can find – you will never be able to reach the same reaction with a canape that you have been slaving over than really good olive oil. You can make your life super easy by picking up marinated olives at an Italian deli – and while you are there find a few extra things to treat your guests with perhaps. Or you could make your own, our favourite is to keep it simple with slices of lemon, thyme and garlic, mix together with olive oil and season and they will keep in the fridge for a couple of weeks (just make sure you take out the fridge in time for as the olive oil will solidify). We want to keep our starters as fresh and hassle free as possible and it’s a good time to make a plate look pretty and as festive as possible, because after a few bottles of red no one will remember the pud – so make a splash with your starter. 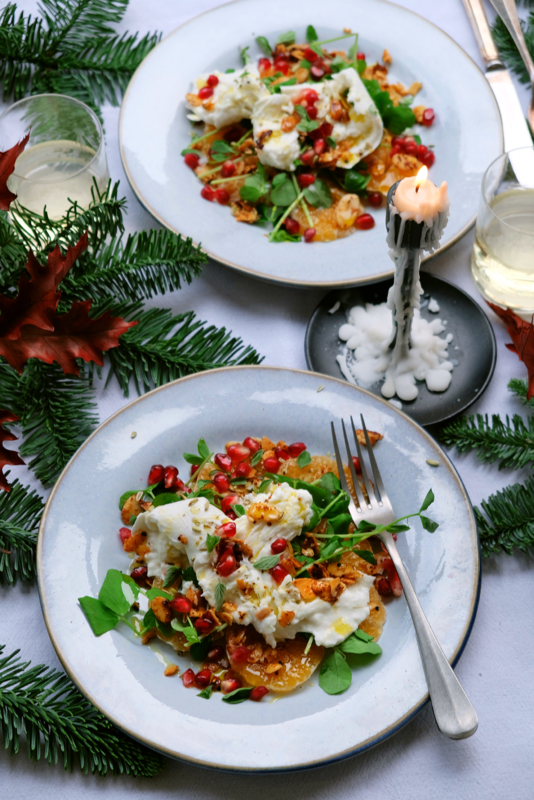 For us this dish is about the colour, the balance of sweet and sour and the texture – a mixture of creamy, smooth mozzarella, the bite of the pomegranate and the crunch of the nut – all in all it should come together nicely as one. You could mix up the ingredients – use blood orange, tangerine instead of the clementine and barrata instead of the mozzarella – if using burrata try and get a small one and serve one per plate as it is difficult to share. If you are having your party on a week night then we would suggest cooking something wonderfully slow cooked in advance – a one pot wonder so there is no last minute cooking and fussing. The worst host is someone who is slaving away in the kitchen whilst your guests are arriving (we are all guilty of this), you want to freshen up, put on a great playlist and pour yourself a glass of bubbles. Decorate with lots of candles and turn the lights down which will hide any mess that you didn’t have time to clear up. If you don’t have time to make dessert then pick up some mince pies, there are plenty around that look homemade, heat them up and serve with whipped cream. First heat the oven to 180c. Place the butter in a small pan with the sugar and the cayenne pepper - allow to melt and for the sugar to dissolve. Take off the heat and mix in the flaked almonds. Line a tray with baking parchment and pour on the almond mixture, place in the oven for about 5 - 8 minutes – till golden. Leave to cool. Peel the clementine’s and slice – about ½ a cm thick is great. Divide the clementine’s between four plates and scrunch on top some of your green leaves. Next roughly pull apart the mozzarella and place on top on the greens and clementine slices, then crunch over the almond brittle, sprinkle over the pomegranate seeds, fennel seeds and fresh oregano leaves. Drizzle with good quality olive oil and season with sea salt and a little black pepper and serve.